ROME - Juventus drew away at Ajax in the first leg of their Champions League quarter final as talisman Cristiano Ronaldo scored yet again to bag an all-important away goal for his side. Ronaldo, whose goal marked his 125th in the tournament, proved once more why Juventus paid big money to tempt him away from the Bernabeu last summer. His side had been under the cosh for much of the first half, Ajax squandering a handful of glorious opportunities to take the lead as the youthful Dutch outfit produced more of the stunning football that saw them knock out holders Real Madrid in the previous round. But his class eventually proved the difference in the first half as he powered in a header from a move he started around the halfway line as his side went into the break one-nil up. 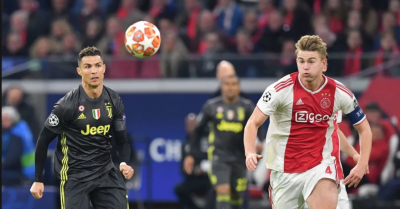 Juventus will have gone in at half-time knowing Ajax would be unrelenting in their hunt for an equaliser, but they will inevitably have been disappointed that it came a mere 45 seconds after the restart. David Neves curled a wonderful strike past Wojciech Szczesny in the Juventus net as the Johann Cruyff stadium erupted and Ajax once more found their stride, pushing for a winner. A second goal did not come however, and it was Juventus who could have snatched the victory in the dying minutes when a powerful Douglas Costa run saw him hammer a shot past the Ajax keeper, only for it to cannon out off the post. Juventus will likely go into the second leg the happier of the two outfits. They will know they were fortunate to restrict Ajax to just one goal, and an away goal of their own could prove decisive when the two meet at the Allianz Arena in Turin in a week. The game, however, was overshadowed by fan violence before the match kicked off. Amsterdam Police arrested over 130 football fans, a large number of which thought to be Italian, after clashes between the supporters broke out in metro stations and outside the stadium. Fans at one point also turned on the police who had been trying to break up the unrest with water cannons. A police statement read: “The police carried out many arrests on Wednesday April 10 prior to the Ajax-Juventus match. Two large groups, mostly Italian supporters, have been arrested. “The first group, 46 suspects, was arrested in the metro and the second group, 61 suspects, was arrested at the stadium. Weapons and fireworks were found in these groups. The two sides will meet again on April 16, the winners progressing on to the semi-finals to face either Manchester City or Tottenham. The English sides met earlier this week, and Tottenham will go into the second leg with a slender one goal advantage, knowing that it will take a season-defining performance to hold on for victory against the English champions.